Are you ready for Halloween? My little guy injured his foot a couple of days ago so he’s not able to walk right now. We’re hoping he heals up enough to do a little trick-or-treating next week. After all, we already purchased three Halloween costumes (yes, a little overboard but I couldn’t help myself!) so it would be a shame if he didn’t get to showoff any of them. Are you planning anything special at home for your little ones? Here are some cute Halloween party ideas that are perfect for putting together a party for your kids or even just a cute Halloween treat. As soon as I saw this idea I was eager to share it with you! 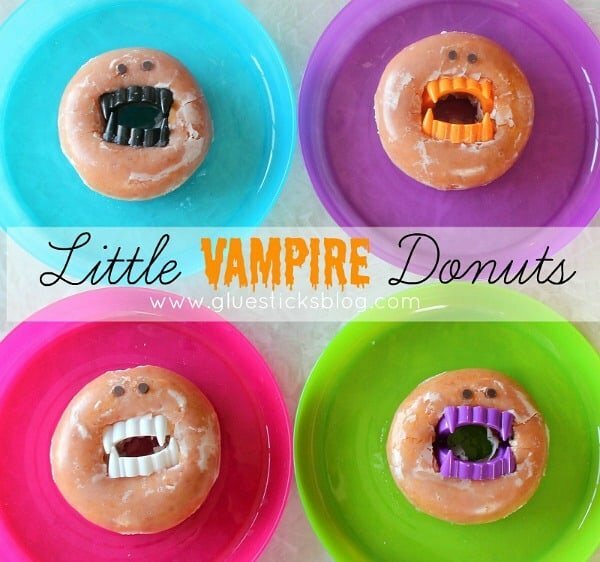 These Little Vampire Donuts by Brandy on the Gluesticks Blog are such a clever idea and so easy to put together! I see a lot of Vampire Donuts in my future! Halloween doesn’t have to be spooky to be fun. These bright child-friendly Halloween party ideas on Celebrations at Home are perfect for guests of all ages. While counting down the days until trick-or-treating, there are so many fun Halloween games to play! 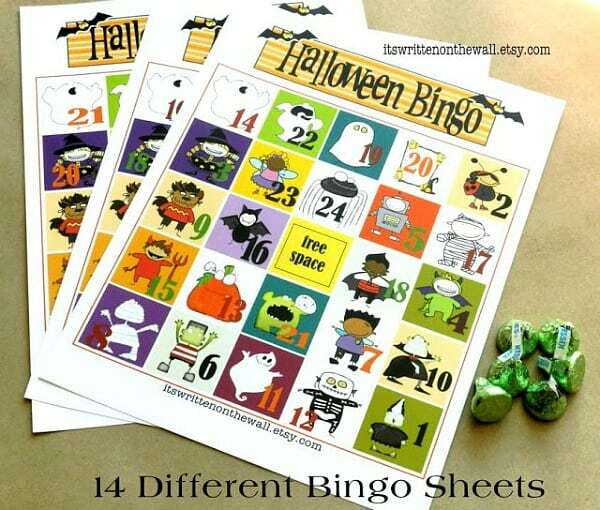 ItsWrittenOnTheWall.com has a fun collection of Halloween Party Games including this Halloween Bingo game. 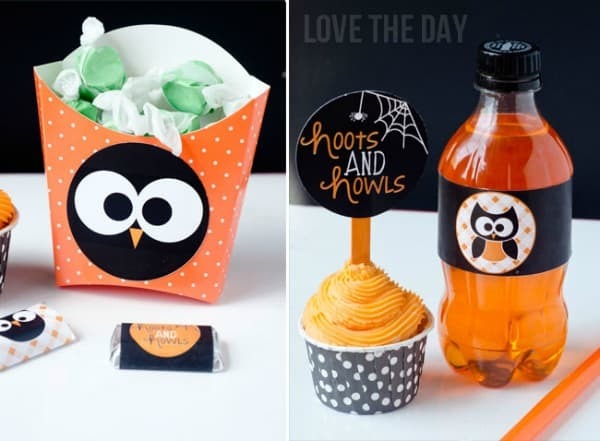 This Owl-oween Party by Lindi of Love The Day is such a unique Halloween theme idea. Check out the favor tag in the post – it’s brilliant! Owls are such a popular birthday party theme but I wouldn’t have thought of using them in Halloween. You’ll love this printable party package and there’s still time to print & assemble them before Halloween. 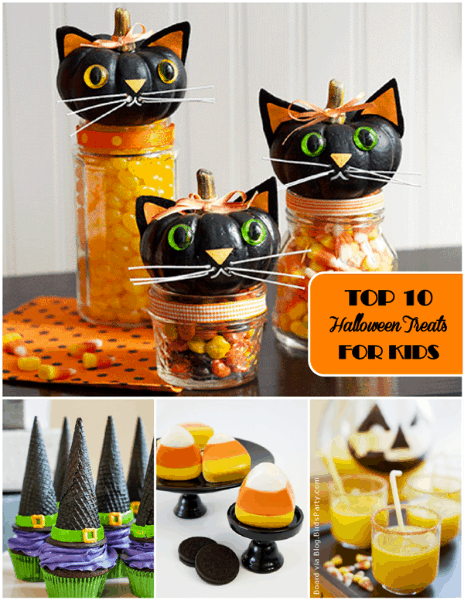 This Top 10 Halloween Treats for Kids post on Bird’s Party is filled with delicious & cute ideas so you could make your kids something special for Halloween. Do you make special treat bags for friends? You’ll find plenty of creative ideas here! 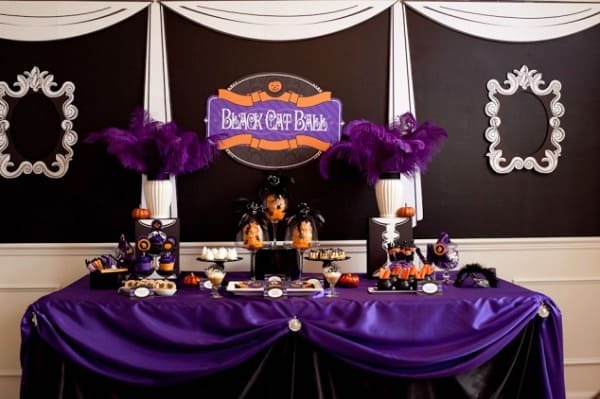 I love the way Paula of Frog Prince Paperie took an adorable Halloween theme and turned it into a formal ballroom style event for kids. This Halloween Black Cat Ball is purrrfect (sorry – I couldn’t help myself!) for a neighborhood or classroom party. This Boy’s Halloween Birthday Party post by Sensationally Sweet Events found via Spaceships and Laser Beams is filled with great ideas. Slightly spooky but totally fun! 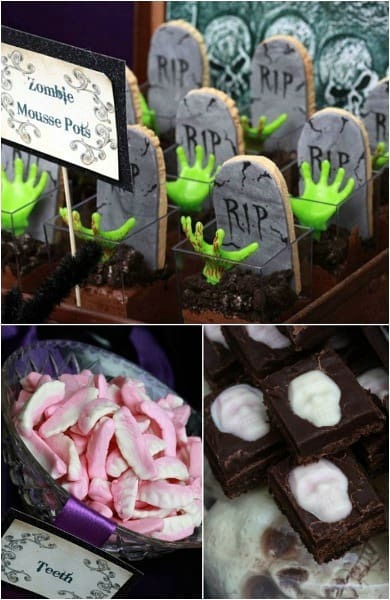 I am in love with these frightfully cute Halloween treats by Party Pinching. 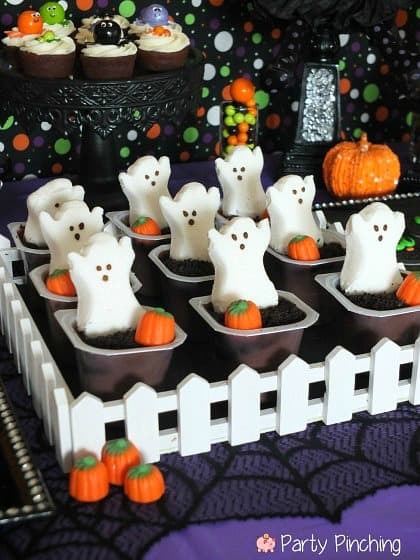 Aren’t those ghosts in pudding cups adorable?! Just wait until you see the rest of the sweet treat ideas in this party – they are all so clever! 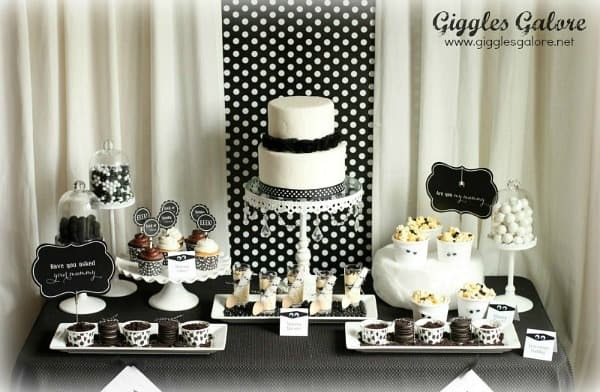 This Mummy & Me Halloween Soiree by Giggles Galore is one of my favorite Halloween party ideas. I love the mummy wrapped spoons and cups. 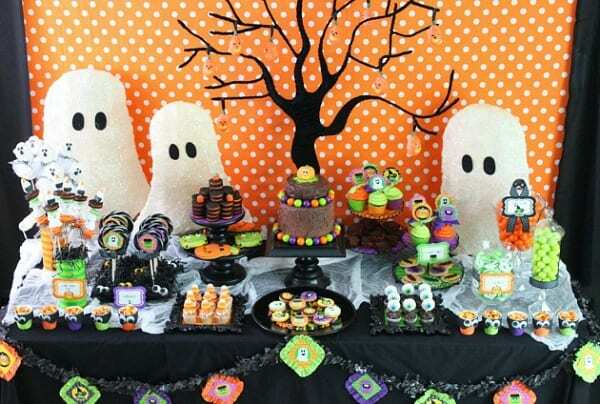 Even if you don’t have time for a full party before Halloween, there are a lot of great treat ideas for kids here. Don’t forget that Moms & Munchkins is filled with free Halloween games as well! Simply visit our Holiday Fun page and scroll down to October for the Halloween section. To stay updated on the latest creative ideas, follow us on Facebook, Twitter, Pinterest and Bloglovin’. So many good ideas here – thanks for sharing with Afterschool!